Standard business check binder is perfect for small businesses that use the three check-on-a-page format sheets of checks sold separately). Premium black/gray textured cover offers contrasting black lining to provide a professional appearance. 1" ring capacity holds approximately 165 pages of checks. Back-mounted, steel D-rings let pages lie flat for easy writing. 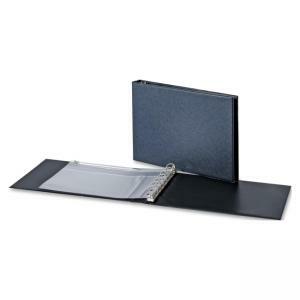 Use the included Eco-friendly PVC pouch to organize your check writing needs and other accessories. The removable pouch includes a zipper pocket to secure contents, a flat pocket for quick access items and a pen slot. 7-ring binder also features exposed rivets and is made with a high percentage of recycled content.